"This is a great twist on two all-American favorites--the potato salad and the loaded baked potato. Served cold, this has been a crowd-pleaser at our many family functions and is often requested. 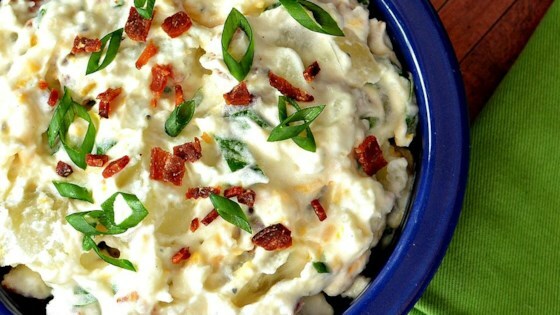 Even people who don't normally love potato salad seem to love this!" Place potatoes in a pot; fill with water until potatoes are covered. Add salt; bring to boil. Simmer until potatoes are just tender enough to be pierced with a fork, about 15 minutes. Drain and run under cold water until potatoes are slightly cool. Mix sour cream, creamy salad dressing, and ground black pepper together in a large bowl. Stir in Cheddar cheese, green onion, and bacon bits; add potatoes. Cover and chill in the refrigerator until ready to serve. Potatoes should be scrubbed and cubed, but not peeled. So easy to make and the Miracle Whip® adds a distinctive flavor to it that will have you coming back for more. Perfect taste and very easy to make! One of my favorite potato salads that I've made. Will definitely make again. Quick and easy to make, mighty tasty, we have made it twice. Once by the recipe and once we added chopped bread and butter pickles. Both ways were awesome! Will keep making this. Yummo! Family loved it. Great as leftovers. Will make again!